Private and personalised Sapporo outing with a handpicked Host.The gateway to Hokkaidō, Japan’s wild and beautiful “last frontier”, Sapporo is a modern, vibrant city which is surrounded by sweeping mountainous landscapes and steaming natural springs. Although the city is young - it was only built in the 19th century - there’s plenty to discover and a delicious food scene to taste. 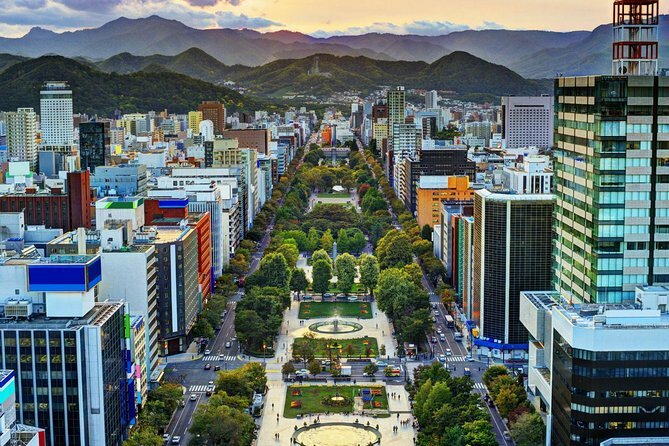 With landscaped sculpture parks, important temples and shrines, historic sites and landmarks from the Winter Olympics, you’ll wonder how you could possibly discover what the city has to offer in just one day! But with your thoughtfully handpicked Host by your side, you’ll be able to visit some of the top attractions as well as a few secret local spots along the way too. Get the best of both worlds and discover the most famous sights like Sapporo Clock Tower, Mount Moiwa and the Hokkaidō Shrine as well as hidden gems that are just around the corner which only locals know about! Join a handpicked Host to discover some of Sapporo’s top attractions, its regional specialty cuisine and its rich culture - in just one day! With your thoughtfully matched Host, choose which of the city’s top attractions you’d most like to see like Sapporo Clock Tower, Mount Moiwa and the Hokkaidō Shrine, or let your Host design a bespoke experience which includes the must-see attractions as well as some hidden local spots. Discover the city’s famous temples and shrines, its history and culture as you explore with your Host and get a feel for this modern city. Stroll through Moerenuma Park, a unique sculpture park where the park itself is the sculpture, or head up to the observation deck of Mount Moiwa to admire the sweeping views over the city, or shop until you drop in the neon-lit, bustling Susukino district. Enjoy some authentic food and discover Sapporo’s native miso ramen, a rich, pork based broth with thick, chewy noodles and topped with corn and butter. Or feast on a fresh seafood “kaisen-don", a dish of raw seafood on rice, “jingisukan”, bbq grilled lamb and of course sip a Sapporo beer! Your Host will also advise you on the best ways to spend the following days of your trip, allowing you to discover the other areas of Sapporo, its most important shrines and temples and cultural heritage. * Get to know the real Sapporo with a handpicked Host, avoiding the tourist traps but seeing the highlights! After booking, you will receive a short questionnaire, so you’ll be able to tell us more about your interests and preferences. Based on your responses you’ll be matched with a Host thoughtfully matched to you. Your meeting point is flexible, and to be agreed with your Host. Meet-up at your hotel or accommodation can be requested, or your Host will meet you at a convenient location close to the start of your experience.